Samsung Galaxy Note 2 with a 5.5-inch screen to be announced late August? The Samsung Galaxy Note is probably a great illustration of swimming against the tide - while screen sizes were rapidly growing last year, the huge leap to a 5.3-inch display left everyone surprised, with many writing off the Note as a niche device. To a certain extent we still think it is, but look at those 7 million Notes Samsung has already sold, and it no longer looks that niche. For those of you who like the original device, good news is that the Korean company is said to be bringing the Samsung Galaxy Note 2 in just over a month at the IFA show in Berlin in late August. This means the new Note will come with a screen 0.2 inches larger than the previous one while retaining the dimensions. Earlier we heard that the Galaxy Note 2 will feature a 12-megapixel shooter and a quad-core processor. Unlike the original Note which is still waiting for its Gingerbread update, its sequel will actually come with the latest of Android, Jelly Bean, from the get go. “There are also talks of improving the camera resolution to 12.0 or 13.0 megapixels, up from current 8.0 megapixels, but this may be changed depending on other factors. It will not, however, showcase the unbreakable plane (UBP) display technology, a precursor to the flexible display. UBP will most likely be applied for the next product released after Galaxy Note 2,” an official allegedly familiar with Samsung’s product development concluded. Just Bring it Samsung ! I am so waiting for that phone/tablet. 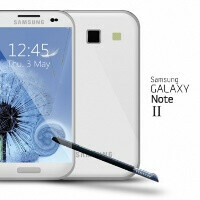 The Samsung Galaxy Note 2 will just be EPIC! do you mean is waiting for ICS update right, because already came with gingerbread. Not for North American Versions so far only T-mobile will have ICS when it's released in a week or so. i got scared when i read that for a second. I think Phonearena is mistaking it for the Dell Streak. haha! Is that waiting for gingerbread or ics?? Instead of including a custom cover, Samsung should include a pair of pants with pockets big enough to carry the phablet. you can keep the 1080p. you cant tell the difference between 720 and 1080 at that level... however it will eat up much more battery life and processing power. better would be SA+ RGB 720p at 330ppi. however, ghost, you want a full PC in your pocket.. lolol. Dear God, it sounds like you just want to carry a desktop everywhere.